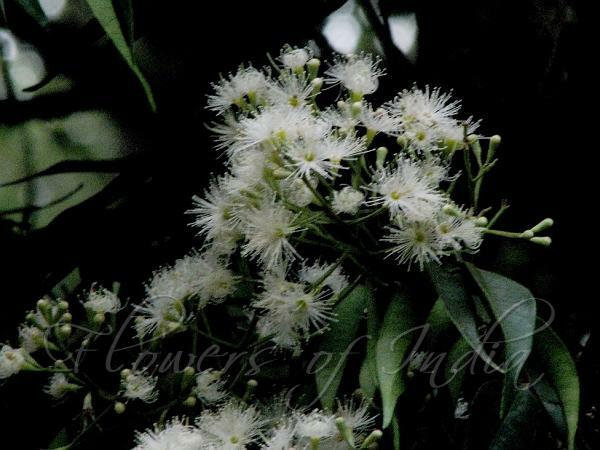 Spicate Eugenia is a small trees, growing up to 12 m tall. Branchlets are yellowish brown when dry, round, old branches grayish brown. Leaf stalks are 4-7 mm long. Leaves are thinly long ovate to ovate-oblong, 8-10.5 cm long, 3-4.5 cm broad, leathery, yellowish brown when dry on the underside, olive green and glossy when dry above, secondary veins are numerous, 2-3 mm apart, at an angle of 80°-85° from midvein. Base is rounded to blunt, tip long-pointed, often falling off, with a 1-1.5 cm cusp. Inflorescences are borne towards the end of branches. They are cymes, 2-4 cm, carried on slender stalk. Flower buds are club-shaped, about 7 mm. The cup holding the flower is 5-6 mm. Sepals are 4 or 5, kidney-shaped rounded, about 1 mm. Petals are pale yellow, distinct, obovate, 3-4 mm. Stamens are longer than petals. Fruit is white, round 5-6 × 7 mm. 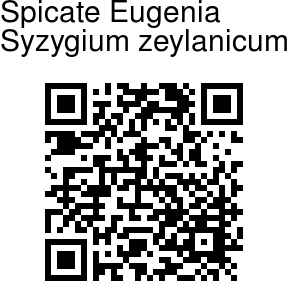 Spicate Eugenia is found in South India, Sri Lanka and parts of SE Asia. Flowering: April-July.